First... I failed at getting up to workout this morning. That's because I didn't sleep well last night. I was ready to head to bed around 11, talked to my boyfriend on the phone until about 12 (a night apart? I KNOW! LOL), and then just couldn't fall asleep. The last time I saw on the clock was 2:30. So yeah...Getting up at six? Not happening. Oh well. I have a little time this afternoon to workout, so I shall. I plan on doing Ripped in 30 again and will most likely run like I did yesterday. I can finally tolerate running a little better. Let me just say that this was a slower than my slow running pace sort of jog, mixed with some walking. I decided that starting Couch to 5K will help me get back into running since it's been a month! I did still have a little pain at the liposuction sites but it really wasn't mad. I guess I'd say it was more discomfort than pain. It was kind of awkward the way things bounced... I remember this from last year. Fat cells were removed so I'm sure the remaining guys are moving around in there. Or something. Whatever it is, I still felt a little discomfort. I'm just happy that it wasn't bad enough that I couldn't run at all. It may have been short jogging periods (a minute) at a slow pace, but at least I got to run a little. Toward the end (as I adjusted to the awkwardness?) it wasn't too bad at all. I actually bumped my pace up to my last running pace for a minute. That? Was nice. It was only a short time but it felt good - especially when I was sweat-soaked and finished!! I got out of order, so backing up... Before my run I did Ripped in 30. That? Felt awesome! To re-cap; I didn't workout at all for over two weeks, I started doing light workouts two weeks ago, last week due to an insane schedule I only worked out at couple times early in the week (well other than walking). So... I've been walking and on the days I did Ripped in 30, I did kept it light, using lighter weights and by (pretty much) creating my own low intensity version of some of it. Yesterday... Totally different! I was able to work at the highest intensity I could and I bumped my weights back up! I was sweating and even breathing hard during the workout. My heart rate got up much higher than I anticipated, and I burned more calories than I thought I would. Like 100 more calories!! It's amazing just how much the intensity that you put into something can impact on your outcome. So there you have it; proof that working at a higher rate of intensity works. Period. Today I'm feeling a little sore, but not bad. I feel it mostly when I use the muscles I worked in certain ways. It feels awesome. I missed that feeling so much!! I cannot wait to workout today!! Change of subject.... Foodie Pen Pals. As I mentioned (last week?) 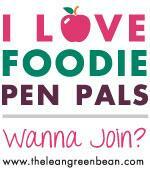 I signed up for the Foodie Pen Pals program designed by Lindsay at The Lean Green Bean. I'm SUPER excited about the program! Earlier this week I heard from the woman who will be sending me a box and I contact the woman I'm sending a box to. I'm already totally excited about this program. I'll be receiving a package from Dallas (Texas). I'm super excited to try whatever she sends. She's also lost a good amount of weight (over 40 pounds -- rock star!!). I loved that at the end she asked if I minded spicy foods... I'm very intrigued! I'm definitely hoping that there's a spicy surprise in that box!! I'll be sending my package to a fellow runner in Illinois. I am excited to pick up some local products to send to her. I'll actually be stopping by a local business today to pick up the contents of my box. She's a healthy eater and eats to fuel her body. She has similar likes to mine (granola, fruits, veggies, nut butters, and other things) so I think that finding some yummy, unique treats to include will be a lot of fun. Basically I'm going to look for healthy things that I would purchase. I actually have a couple things in mind already, but I can't share those with you. Reveal Day is at the end of the month, so be expecting a post of both what I sent and what I received in a couple weeks. I will probably see if she'd like to write a short guest post on the contents of the box! The feedback would be really good for me since it's my first exchange! I'm also hoping she thinks some of the stuff is awesome and tells you all how fantastic I am (jokes today kids; jokes). I forgot what was going to fall under the part of my title about "other ramblings." I think maybe that was just about my insomnia. I really can't think of much else that I want to say at this moment. I DO have a plan in mind that I'd like to share about but that won't be today... I've got to get some more planning and organizing done before I Do that. Well that was a bit of a cliffhanger, eh? I guess it's time to head off to get my workout done! I'm planning an hour, as I said earlier. After that I'll be showering and heading out. One of my stops is the market so that I can prepare my box!! If I don't take too long I should also have time to take the dog-children out for at least a short walk. They really look forward to that - I mean, if they could talk and tell me. I assume so because when I say "go for a walk" they get all excited; running to the door, wagging their little nubs, and the big guy starts to whine. When I grab the leash they're jumping around like wild children. I'm glad they seem to like the walks because it's good for them to get a little exercise! There's also a bonus in that I get a little exercise too. Given that it's a walk, and they have their own preferred pace that isn't the same as mine; a coupler doesn't help my case (at all), I don't burn a whole lot. But that's a okay....200-something extra calories burned is a nice little addition to the daily total, and I get to spend time with my fur babies! Happy Wednesday!! I'm certainly glad that my work week is more than half over! !